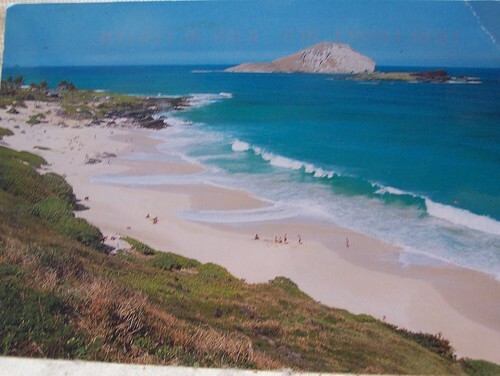 I received a postcard from my friend who is overseas in the military today. I have batches of cards I intended to send him. Damn him for beating me to the first one. Ah the turmoil and spooky in this card. My last major boyfriend was an Aries actually. He seems to.. be as chaotic as the imagery on here. Maybe it’s a sign of what I left behind as I moved forward and on.. to a Sagittarius. Or maybe it means something else… a new version of messed up? Ah well, I already knew I was a bit emotionally masochistic anyway. 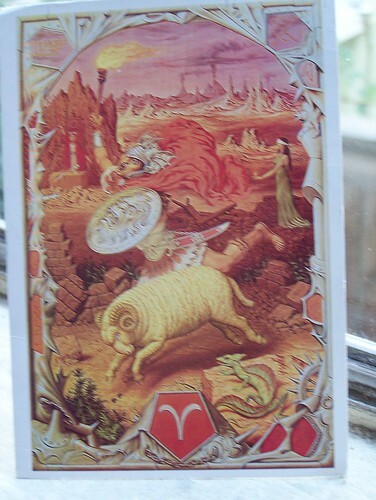 This is not the only card that I have received from Postcrossing that has hit a special tone with me. I am due to potentially see the grip tonight at some festivities. My accomplice for the evening? You guessed it, The Mr. While I do not believe that there will be any issue tonight, I am hoping, praying if you will, that I this card is not a sign of the potential that there could be. I am glowing when I am with this man. I am glowing at the thought of this man. Even if it’s nothing. I just know that whatever it is between us, undefined but great in its form, I just don’t want any problems with it. Here’s hoping this card truly was just a sign that I am better off where I am than where I once was with that previous relationship. I firmly believe that’s all it is. I really need to stop worrying so damn much. Miss Hannah Wingfield of Dundee Scotland asked for postcards with 10 things that make me happy written on them. Since I’ve recently started a series on List Blogs, (not to diminutize you Miss Hannah) I thought it would be fitting to share it with you as well. the rush you get when meeting someone new. of learning something new. or the bonus round: learning something new about someone new that you meet. Life. as generic as it may sound, the feeling of being alive. It’s the most wonderful feeling in this world. I’m a bit odd I suppose. But that wasn’t all of the nearly perfect timing. The card was from a 40 year old mother of two teenagers named Gina. She is formerly from the OC. I wrote her a reply to ask her how she came to Brainerd after living in Orange county and am awaiting her reply. And in my head I can just envision this mother with two teenagers… trying so very hard to teach them all that is important. To enjoy life. And never let anyone take away that magical gift.. of making your mark on the world. What a lovely thing to come home to. I think it just got a bit more cozy.